For other uses, see Chris Brown (disambiguation). 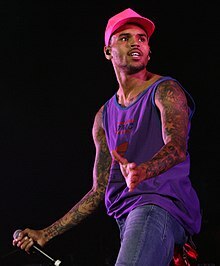 Christopher Maurice "Chris" Brown (born May 5, 1989) is an American singer, songwriter, dancer, and actor. "Forever" is one of his most famous songs. He has won three American Music Awards, three MTV Video Music Awards, eleven BET Awards, and a Grammy Award. He got attention when he was arrested and convicted in 2009 for beating his then-girlfriend, R&B/pop singer Rihanna. He was sentenced to five years probation and six months community service. He was also ordered to stay at least 300 feet away from her for five years. Brown has bipolar disorder and post-traumatic stress disorder. He made his own record label CBE (Chris Brown Entertainment or Culture Beyond Your Evolution) in 2007.